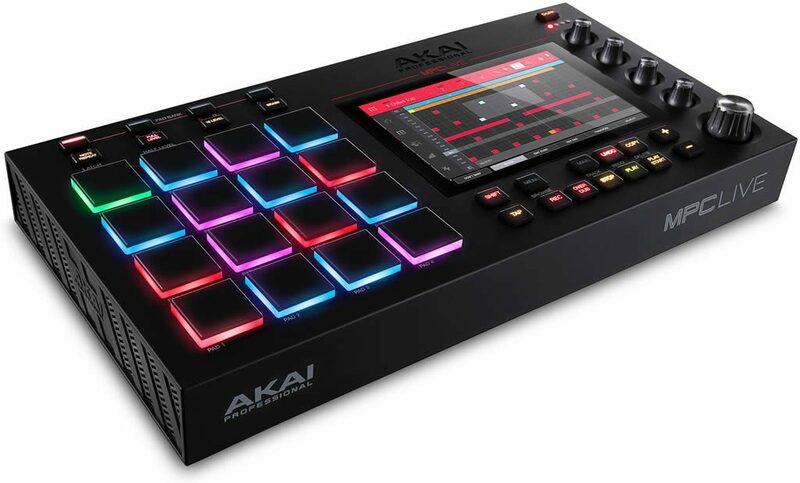 The MPC world is buzzing this morning as details have now been official released for the two new standalone MPCs from Akai – MPC X and MPC Live. The MPC X is the new flagship MPC from Akai. It’s a fully standalone MPC with a huge 10.1″ touchscreen display. As predicted, this will be a ‘hybrid’ MPC, so you can choose to run it completely standalone or connect it to your computer and use it as an MPC Software controller. As you can see there’s lots of input and output options, with 8 1/4″ outputs, turntable connectors and mic inputs, 4 MIDI outs and the USB ports can also be used for MIDI over USB. We’ve even got CV/Gate outputs for analogue synth control. When it comes to storage we’ve got a 2.5″ SATA port for HDD or SSD drives, SD card slot and USB ports for removable media and drives, on top of the 16GB built in, so pretty much all bases covered. Interestingly the original FCC leaks showed us that the main board being used in these MPCs supports wireless and bluetooth (and ultimately that is why the test reports needed to be submitted to the FCC in the first place), but so far there’s no mention of wireless support. Was this dropped, or just missing from the specs? It seems that wireless support and Ableton Link will be coming in a future update. One of the interesting things that have been pointed out is that the MPC X, unlike the MPC Live and MPC Touch, has the traditional 4-cursor key pad for navigation, which will appeal to people who wish to use the touchscreen purely for viewing. On the Live and Touch, you are required to use the touchscreen to select certain parameters (i.e. the ones not assigned to a Q-Link). As you can probably see, when flattened, the large 10.1″ screen does poke out of the back of the MPCX which has led to people wondering how easy it will be to break it during transport. It’s a shame the screen doesn’t either tuck itself away, or even detach for safe storage. On the whole the features seem to be as the leaks predicted, however the whopping $2199 pricing is more than most expected. UK customers seem to have faired much better with GAK pre-order prices coming in at £1449. Launch Price: $1,199 US, £799 UK. The MPC Live is also a completely standalone ‘hybrid’, with the added benefit of portability with its smaller form factor and built in rechargeable lithium battery. 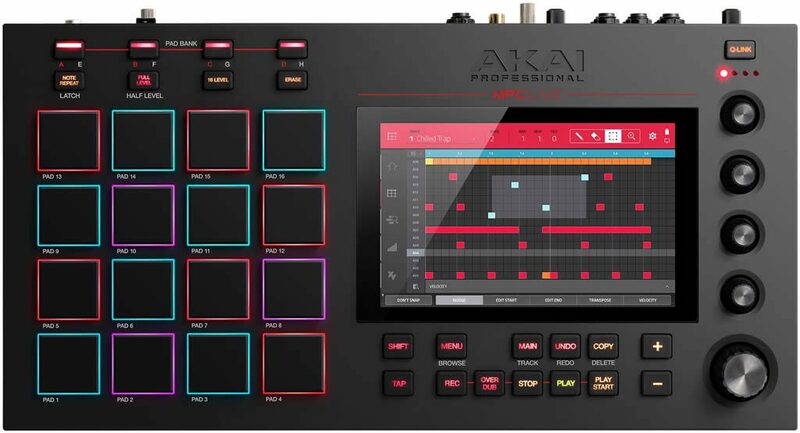 The ins and outs aren’t quite as good as the MPC X, but I suspect that most bedroom and semi-pro producers will not miss the slightly reduced specifications on this front. 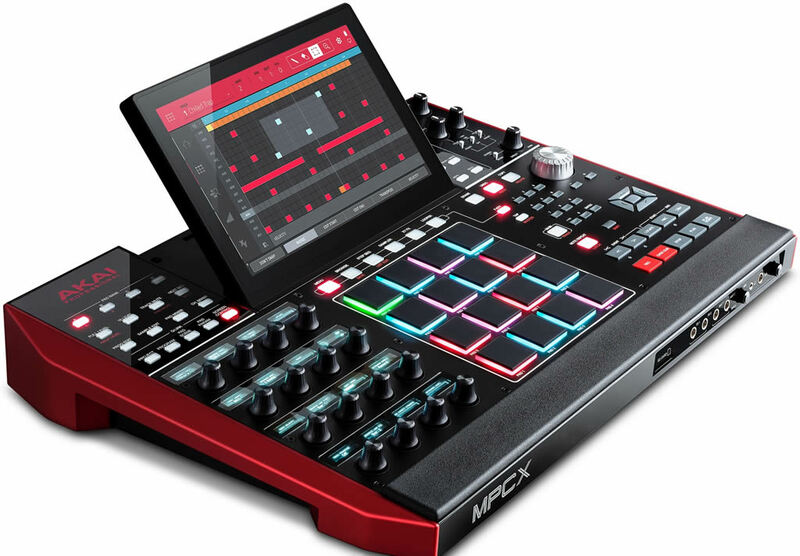 It seems when it comes to storage, the MPC Live has the same specs as the MPC X. However it’s the screen and control elements that might put folks off the MPC Live. Suddenly that 7″ touchscreen looks pretty cramped compared to the X’s 10.1″. And the X’s sixteen OLED labelled dials look pretty amazing compared to the Live’s basic offering. One of the Live’s most unique features is the internal lithium battery, which can allegedly give up to 5 hours playback, taking around an hour to recharge. This will make the Live very popular with producers who need an ‘on the go’ solution, giving you the opportunity to knock out production quality beats whenever the mood takes you. And as MPC Software 2.0 features audio tracks you can even use the Live as a portable multitrack recorder to capture live performances. Are these both truly standalone? Yes, these are standalone MPCs, in fact they are ‘hybrids’ as they can function standalone or as a controller for the computer based MPC Software. There are some restrictions in standalone mode, the main one is that you are limited to 8 stereo audio tracks at 44.1kHz/24 bit – while in controller mode, you can have 128 stereo audio tracks at (I believe) up to 96kHz/24 bit. Another limitation is that you cannot use third party plugins while in standalone mode, i.e. no VST/AU effects or instruments. Akai have yet to confirm whether Hybrid 3 and the other included ‘Akai’ plugins (the Bank, the Wub etc) can function in standalone mode, but I suspect the answer is currently ‘no’. Similarly, we are currently not sure what effects are available in standalone mode. What About MPC Software 2.0? 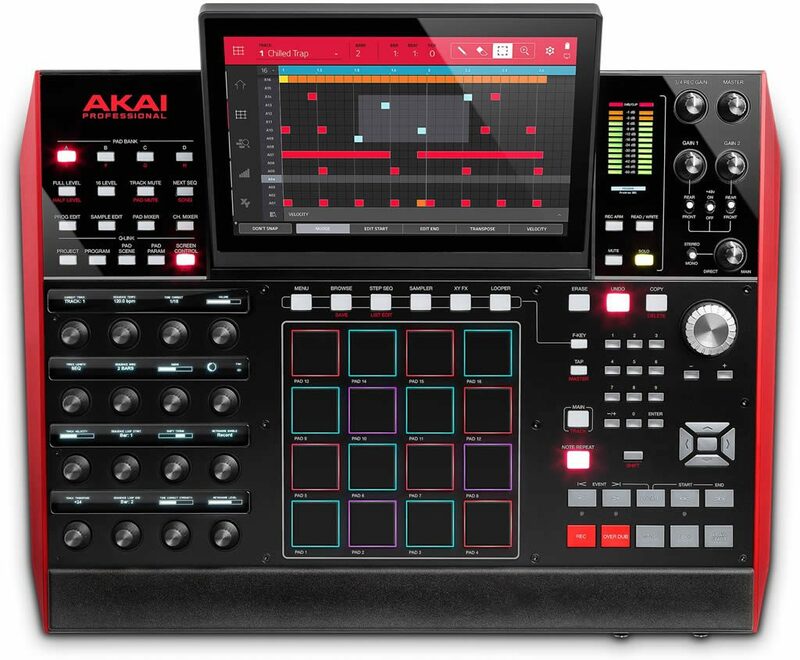 Since writing this article, Akai released details of MPC Software 2.0 (except for upgrade and pricing details). This new update will include audio tracks, real time pitch shifting and time stretch, warping, the new clip program type, lots of new effects and instruments, improved browser with search, a complete overhaul of the GUI, and many more improvements. Check out my separate article detailing the MPC Software 2.0 Specs. 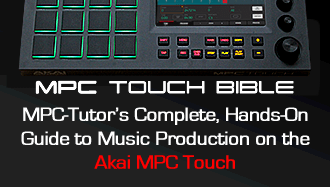 Learn how to use the MPC X and MPC Live with MPC-Tutor’s new tutorial book, ‘The MPC X & MPC Live Bible’, featuring dozens of hand-on beat making tutorials and projects for the MPX X & MPC Live – find out more here! MPC-Tutor (Andy Avgousti) is a beat maker, musician, sound designer and a leading expert on the Akai MPC sampler, who since 2002 has been creating critically acclaimed MPC tutorial books including the groundbreaking 'Beat Making on the MPC' and MPC Bible series. He runs the MPC-Tutor.com network of sites, which includes MPC-Samples.com and the thriving MPC community at MPC-Forums.com, regularly helping tens of thousands of MPC users every month with MPC technical support and guidance. Do you know if the MIDI sequencer can record and preferably edit 14-bit NRPN messages and sysex..
MY 2500 does, my old 2000xl recorded sysex in real time and I assume it did NRPN (e.g. for tweaking a Yamaha DX/TX synth)..
No mention of it in the MPC Studio manual. My old Yamaha TX-81z needs it to be truly useful, and so does my DSI Tetra and evolver synths.. Thanks for the info your posted. I haven’t found any info on whether you can use the MPC live as a sequencer, just like the old MPCs….64 MIDI tracks…apart from the audio tracks it features now. In other words are there high quality real drum sounds, not hip hop, rap drums etc as those are unusable in any situation outside of those genres. Where can I hear those sounds if they are being offered within the MPC X unit ? With my new-age workflow, I don’t really see how this MPC is “standalone” with no Vst support. It will be useless to many producers who’s whole workflow is now based around virtual instruments. Am I supposed to hook this thing up to a Korg Triton or something? VSTs are available when you connect the MPC to your computer, so if your workflow is tied into the computer and VSTs, you just treat the MPC as a controller like you currently do with the Touch and Ren. They want the standalone to be 100% stable with a completely controlled environment, they cannot guarantee that once they start letting people install third party software inside it. Additionally the processor used doesn’t support VSTs, so they would have to be specially ported to the MPC, which is potentially an option for the future, i.e. approved plugins that have been specially ported over by Akai themselves. As I understand it, to use VSTs in standalone mode you render them with mpc 2.0 in the computer and transfer them over to the hardware. May not work for everyone, but it’s still a nice feature. MPC X and MPC Live in standalone mode, can you get samples in REX format of which size in megabits? Do you accept REX file of 24 and 16 bits? What about the frequency of samples 44.1 and 48.0 Khz? What is the total size of a megabit loop that they accept? Thank you. if you can use 8 audio track in standalone mode . how many bars are this 8 audio tracks ? No limits as far as I’m aware. Is it possible to upgrade the RAM once I have my unit? can clips be of different bar lengths within a single project / song ? similar to Ableton. and is it possible to create polyrhythmic beats by having clips of different lengths and not just all at 4/4 ? So if I have 20 tracks of audio/samples , can I route them to Logic Pro without the mpc 2.0 software?